LOS ANGELES, California (CNN) -- The woman allegedly assaulted by singer Chris Brown in Hollywood early Sunday was his girlfriend, singer Rihanna, according to sources close to the couple. 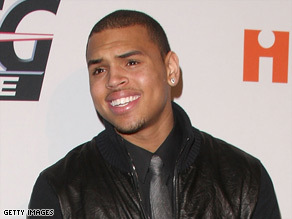 Chris Brown attends a party saluting music producer Clive Davis in Beverly Hills, California, on Saturday. While Los Angeles Police have a policy against identifying alleged domestic violence victims, two people who know both Brown and Rihanna confirmed she was the woman police said had "suffered visible injuries and identified Brown as her attacker." Brown, 19, turned himself in to police Sunday night after police said they were looking for him. He was arrested on suspicion of making criminal threats. Brown was later released on a $50,000 bond and given a March 5 court date. "Detectives investigating the alleged domestic violence felony battery booked him for criminal threats," a statement from the Los Angeles Police Department said. "At the time the case is presented to the Los Angeles County district attorney's office, additional charges may be filed." Brown, nominated for two Grammy Awards, was scheduled to perform at the show. His girlfriend, singer Rihanna, abruptly canceled her planned Grammys performance, but neither her spokesman nor the show organizers gave a reason. "Rihanna is well," her spokesman said in a written statement. "Thank you for concern and support." - Sophomore CD, "Exclusive," included hit singles "Kiss Kiss" featuring T-Pain, "Wall to Wall" and "With You"
Brown, 19, and Rihanna, 20, were seen together Saturday night at a pre-Grammys dinner at the Beverly Hills Hilton, about five miles from where police said the alleged incident happened at 12:30 a.m. Sunday. The police statement said Brown and a woman were in a vehicle near Hollywood's Hancock Park when "they became involved in an argument." "After stopping his car, Brown and the woman got out and the argument escalated," police said. After receiving a 911 call at about 12:30 a.m. Sunday, officers found the woman at the scene of the alleged fight, but Brown had left, the department said. Investigators were treating the incident as a possible felony battery case, police said. Executives with Brown's record label at the Grammy Awards told CNN they knew nothing about the incident and declined further comment. Brown was nominated for two Grammys this year, including in the best male R&B vocal performance category for his song "Take You Down." He also shares a best pop collaboration with vocals nomination with Jordin Sparks for "No Air." The introduction to the CBS broadcast of the Grammys, apparently pretaped, listed both Brown and Rihanna as performers.